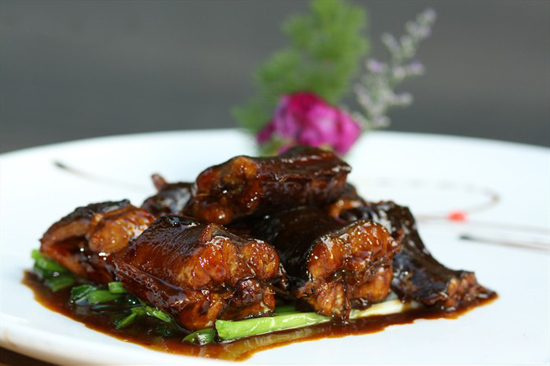 Zhejiang is a province abounding in culinary traditions, with dishes that are as diverse as they are delicious. While the city of Ningbo has been famous for its sugary confectionaries since the Qing Dynasty (1644-1912), Shaoxing’s gastronomic pedigree in fermented foods stretches all the way back to the Warring States Period (c. 476-221 B.C.)! 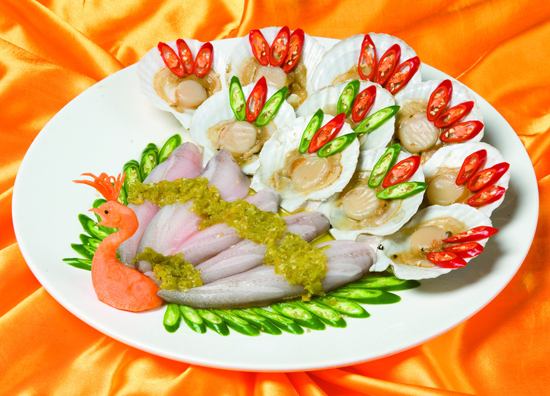 From coastal delicacies to quick-fried street food, the snacks of Zhejiang are packed full of flavours that have been refined over hundreds of years. After all, the greatest teacher of any skill is time! Beggar’s Chicken is a gourmet dish that is so delicious you’ll be begging for a taste! 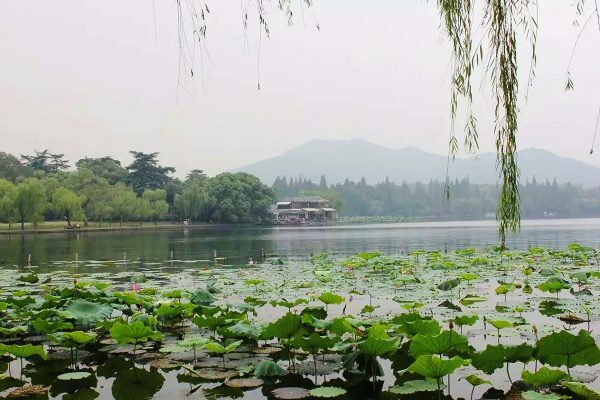 Its unusual name is derived from yet another local legend about a beggar living in Hangzhou during the Qing Dynasty. This beggar was so hungry that he eventually stole a chicken from a small farm. The farmer chased him down to the riverbank and, in a desperate effort to hide his loot, the beggar buried the chicken in mud before fleeing the scene. When night fell, he returned to the river and retrieved the chicken from the muddy bank. He had no oven to cook with, so he simply lit a few twigs and set the mud-soaked chicken over the bonfire. After some time, a light brown crust formed over the chicken and, when it was cracked open, the feathers miraculously dropped off. All that was left was the chicken’s meat, which was so moist and tender that the beggar couldn’t believe his luck. In some versions of the story, the Emperor happened to pass by the beggar and was drawn in by the chicken’s sumptuous aroma. 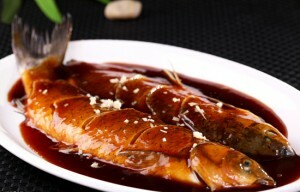 Supposedly the Emperor was so taken by this flavourful dish that he had it added to the imperial court menu! Needless to say, the beggar soon started selling his unique creation to the local villagers and wasn’t a beggar for much longer. 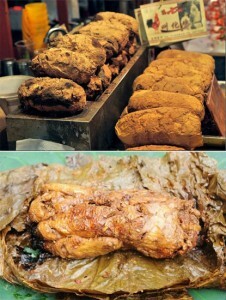 Nowadays, the chicken is normally stuffed with aromatic spices, wrapped in lotus leaves or a flour-based dough, and baked over a low heat for upwards of 6 hours, although some restaurants still follow the traditional method of covering the chicken with clay. After all, you shouldn’t muck about with a centuries-old recipe! 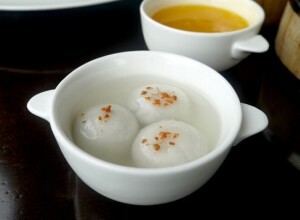 Ningbo Rice Balls or Tangyuan are one of the city’s most celebrated confections. Tangyuan are a popular festival food throughout China and are believed to have appeared sometime during the Song Dynasty (960-1279), although they didn’t reach significant popularity until the Ming (1368-1644) and Qing dynasties. Like many great innovations, it seemed that these sweet dumplings were a little before their time! They are made using glutinous rice, which has been rolled into the shape of a ball and boiled, steamed, or fried before typically being served in a syrupy soup. Stuffed tangyuan are made by first rolling the filling into a ball before wrapping a flattened piece of glutinous rice dough around it. The best tangyuan must have a chewy skin that does not stick to your teeth and are said to be so soft that you can push the filling out with a small bite. The Ningbo variety is marked by its distinctive filling, which is made using lard, soft white sugar, and black sesame paste. The lard melts as the tangyuan are boiled, softening the black sesame paste and sugar into a tantalisingly sweet syrup. Although these squishy treats are traditionally eaten during the Lantern Festival, locals in the Ningbo region love them so much that they even eat them for breakfast on the morning of Chinese New Year! Nowadays they are no longer exclusively a festival food, and are served as a dessert or simply as a sugary snack throughout the year. The name “stinky tofu” hardly inspires one with confidence. Comical though it may seem, this unusual epithet is tragically not a mistranslation. Foreigners and locals alike have described the snack’s odour as resembling “rotting garbage” or “an open latrine”, so it goes without saying that you might want to keep a nose-peg handy if you fancy trying this strange dish! 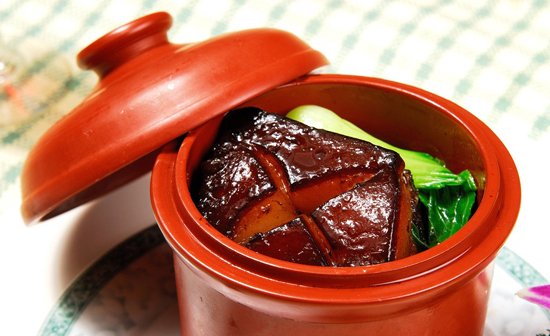 The distinctive aroma originates from the liquid that the tofu is fermented in, known as lu or fermenting brine. It is made using woody amaranth stalks that have been covered in cold water and left in a clay pot until they start to rot. This process normally takes between 2 to 4 days, and the resulting brine is so pungent that people unused to the smell can’t stand to be near it. The amaranth stalks are then removed and served up as part of their own dish; one of Shaoxing’s well-known chou mei or “stinky and rotten” delicacies! Batches of tofu are soaked in a mixture made from this brine, along with fermented milk, mustard greens, bamboo shoots, and Chinese herbs. This formula varies from region to region and individual to individual, so each batch of stinky tofu has its own unique stench! Once it has been left to ferment for a number of days or even months, the tofu is removed and is either deep-fried or steamed. 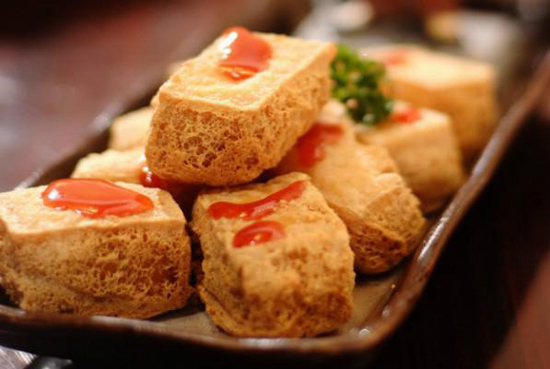 The stinky tofu eaten in the average household is normally steamed with green beans, while tofu sold at street food stalls is usually deep-fried and served with a hot chilli sauce. This odorous delight is said to have a strong, mature flavour that somewhat resembles blue cheese. Apparently, the smellier the tofu is, the better it tastes! Originating from the small northern county of Shengzhou, these steamed buns or xiaolongbao may not be as famous as their counterpart in Shanghai, but they’re certainly no less delicious! 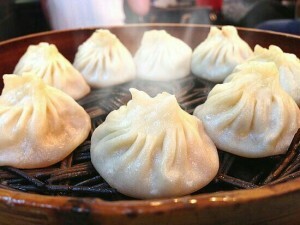 Unlike other regional delicacies, which normally have histories dating back hundreds of years, Shengzhou Steamed Buns are a relatively new culinary treat. They were the brainchild of Tu Fuyuan, a local from Yuxi Village who travelled to Guizhou province during the 1980s in order to make money for his family. He ended up working as an apprentice under a local steamed bun merchant and, after learning the basics, he returned home to open his own steamed bun shop. His buns were so popular that they even spawned a string of copycats, who each attempted to recreate Tu’s original recipe. After all, imitation is the sincerest form of flattery! Nowadays authentic Shengzhou Steamed Buns must be made with top-quality rice flour, fresh meat, and five different seasonings, including the local rice wine. These scrumptious dumplings are normally steamed on a bed of fresh vegetable leaves, in order to give them an aromatic boost. 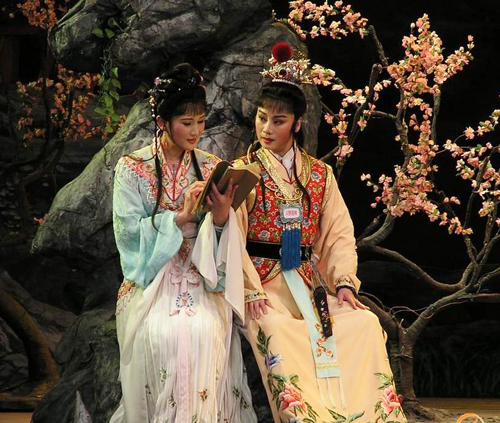 Yue Opera is the second most popular style of Chinese opera after the world-renowned Peking Opera, which is no small achievement when you consider that there are over 360 opera genres in China. After all, there’s nothing wrong with getting a silver medal! It originated from Sheng County (modern-day Shengzhou City) in the Shaoxing region of Zhejiang province and is thus sometimes referred to simply as Shaoxing Opera. The name “Yue” is derived from the ancient State of Yue, which ruled the region during the Spring and Autumn Period (c. 771-476 BC). It enjoys great prestige in Zhejiang, Shanghai, Jiangsu, and Fujian, although the style attracts audiences from all over China. Like many styles of Chinese opera, it evolved from the conversations that farmers would have and the folk songs they would sing when working. They became particularly popular with rural communities because they contained vivid and romantic descriptions of normal daily life. Kind of like watching your favourite soap opera! During economic downturns, many farmers would turn to this folk art as a secondary job in order to supplement their income. Over time, performers began to integrate simple acting sequences and musical accompaniments to further enhance the art. Towards the end of the Qing Dynasty (1644-1912), the opera form began to take shape and groups of performers were known as “Didu Troupes”, a name derived from the characteristic “didu, didu” sound made by the accompanying drum and sandalwood clappers. Imagine having someone name your band “Guitar Riff” or “Drum Beat”, and you can see why the performers may have been dissatisfied with the title! In 1906, the first official performance of this operatic style was staged in the city of Shengzhou and by 1917 Didu Troupes had started performing in Shanghai. Finally, in 1922, they formally changed the style’s name to “Shaoxing Wenxi” or “Shaoxing Literal Opera”. It may not exactly roll off the tongue, but at least it was better than being named after a sound effect! Originally this style was performed solely by male actors, but in the late 1920s an all-female troupe named the Women’s Refined Opera emerged. In a true demonstration of girl power, this troupe became so popular that all-male troupes were completely replaced by all-female troupes during the 1930s and 1940s. It was around this time that the name “Yue Opera” was formally adopted. Yet precisely why this opera style switched to exclusively female troupes is still a subject of great debate among opera enthusiasts. On the one hand, the economic downturn caused by the Wall Street Crash in 1929 had far-reaching effects in China, which caused many women to seek out alternative ways to make money and thus train as opera singers. On the other hand, many people argue that this style of opera lends itself to a more feminine performance and this is why all-female troupes were simply more popular. Regardless of motive, the presence of these female performers and their dominance over the art was an undoubted boost to the women’s rights movement at the time. During the 1950s, the style went through a huge artistic reform driven by woman named Yuan Xuefen. It adopted several features from other performance arts, including the ancient Kunqu Opera and modern Western music. In this way, Yue Opera was able to drastically distinguish itself from other styles of Chinese opera. Not long thereafter, the traditional Mu Biao system, where performers would only have an outline of the story but were free to improvise, was abandoned in favour of conventional scripts and directors. Modern stage settings and lighting were introduced, as well as some western musical instruments, which further helped to establish Yue Opera as a more progressive style of Chinese opera. After the establishment of the People’s Republic of China in 1949, the style became popular with several members of the Communist Party and reached the peak of its fame during the late 1950s and early 1960s. However, like many traditional Chinese art forms, it was outlawed during the Cultural Revolution (1966-1976) and this proved to be an almost fatal setback. It enjoyed a revival during the 1980s and, although it has never recaptured the success of its glory days, it continues to captivate foreign and domestic audiences to this day. It is characterised by its fresh, graceful, and lively style of singing, which is sweet-sounding and lends itself to the telling of love stories. Unlike other forms of opera, which incorporate acrobatics, martial arts or dancing, the focus in Yue Opera is almost solely on the singing. Subject matter is usually derived from fairy tales, literary classics, or historical stories, such as Liang Shanbo and Zhu Yingtai (The Butterfly Lovers), Dream of the Red Chamber, Peacocks Flying to the Southeast, and Fang Qing Visits His Aunt. Bear in mind that making a humdrum visit to see a family member seem exciting is no mean feat! When it comes to costume, silks and satins take centre stage as clothing materials are chosen for their soft texture and appearance. The use of plain, block colours gives these costumes an unparalleled elegance, although a type of embroidered robe known as a mangpao is also sometimes used. To complement this subtle style, natural make-up is often employed to give the actors a softer appearance. So, if you’re searching for that au naturale look, perhaps a trip to the theatre is in order! 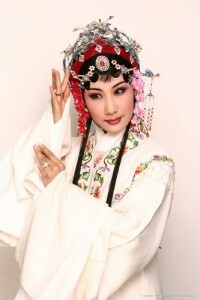 Kunqu Opera: Also known as Kun Opera or simply just Kunqu. It is the oldest surviving form of Chinese opera and dominated Chinese theatre from the 16th right through to the 18th century. Many popular styles of Chinese opera, such as Peking Opera and Yue Opera, were greatly influenced by this style.